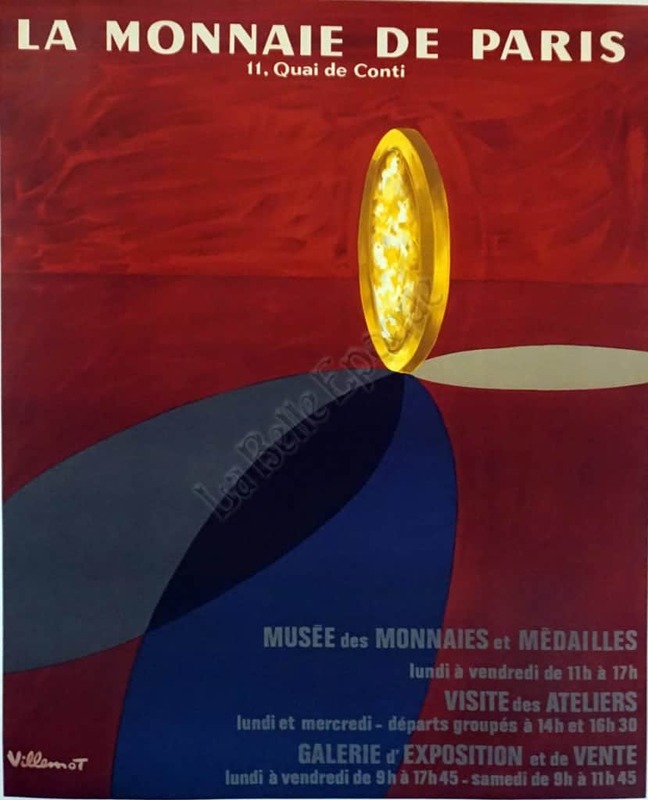 This is a Modern period French advertising poster for the Museum of Currency in Paris, by the artist Bernard Villemot. This large poster features a rich deep two-toned red background with visible brushstrokes; a bright gold coin stands in the center casting three shadows around it, one blue, one gray, and one off-white. The complex use of color, perspective and lighting that Villemot utilizes in the piece makes the coin practically jump out of the background. There is text, in a subtly complementary dark grey, at the bottom right hand corner that provides detailed information on the museum and its exhibits. Founded in 864 AD, it is the world’s oldest continuously running minting institution operating. The Monnaie de Paris (Paris Mint) is responsible for producing France’s euro coins, and was founded by Charles the Bald, a grandson of Charlemagne, with the goal of centralising and gaining control of France’s currency.